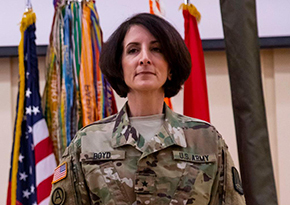 U.S. Army Reserve Colonel Tina Boyd, chief of staff, 335th Signal Command (Theater) was promoted to Brigadier General during a ceremony at Georgia Institute of Technology, Atlanta, Georgia, January 13, 2019. Boyd, an alumna of Georgia Tech pinned on the one-star insignia during a promotion ceremony held at the university. Greene '70 Releases "College Prep for Musicians"